Thanks for following us on this blog. If you'd like to keep up with our continuing adventures, then hop over to the new English Magic Tarot website. Check out this great review courtesy of New Age Hipster! Continuing our series of posts on decks that have inspired Rex: this week, the Crowley Thoth tarot. The Thoth tarot deck, painted by Lady Frieda Harris under the guidance of Aleister Crowley. Rex writes: My first ever reading was from a gypsy witch in St. Ives who used the Thoth, deck. I found the witch, the cards and the reading utterly enthralling. Years later I discovered the deck was painted by Lady Frieda Harris under the guidance of Aleister Crowley, the Great Beast himself. The cards pictured here were given to me by my friend Stephanie Lightsmith along with the suggestion,”You should make your own tarot cards one day”. Andy adds: I have used the Thoth deck for years. I discovered it after reading Robert Anton Wilson. What struck me was how three-dimensional the images are, as though you could tumble right down into them. Cards like The High Priestess and the Universe are properly psychedelic. Though it pulls no punches, the deck remains one of my favorites. 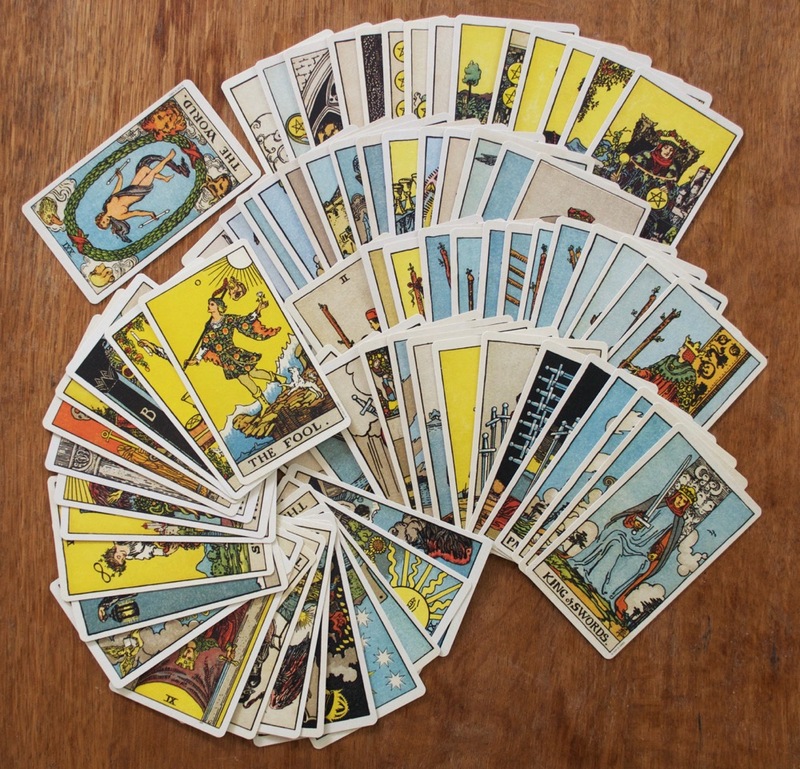 In this series of blog posts, Rex Van Ryn, creator of the English Magic Tarot, tells us about the tarot decks that have most inspired him. This week, the so-called Rider-Waite deck, beautifully brought to life by Pamela Colman Smith. Rex says: What more is there to say about the cards that started the ball rolling? These iconic images speak for themselves. No wonder Pamela's deck is the most popular with beginners. 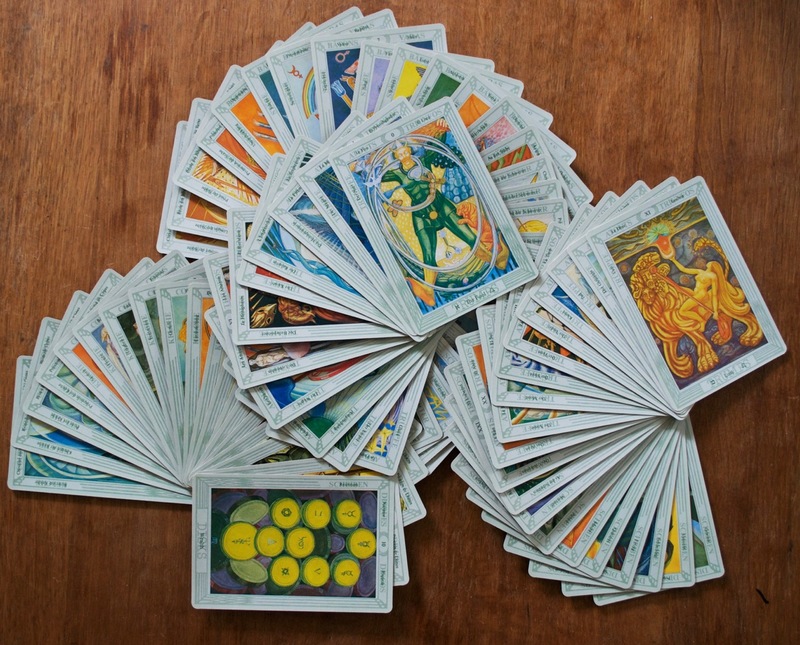 It defined tarot for the twentieth century. Interested in other forms of divination than the tarot? 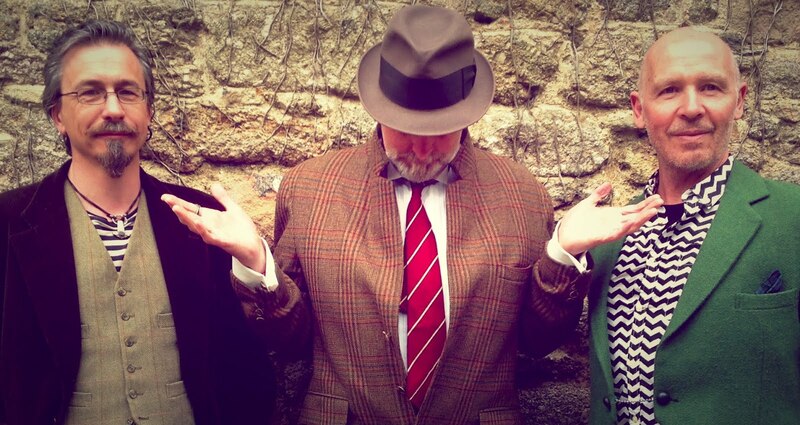 The wonderful Troy Books have just produced this video for Boscastle's Museum of Witchcraft and Magic, and their current exhibition: ‘Glitter and Gravedust – Halloween Past & Present'. The video shows all manner of mantic arts, from divining by dropping molten lead into water, to gazing into mirrors in hope of seeing one's future spouse. The soundtrack is a fantastic piece of folk horror too. Highly recommended. It's a question that concerns anyone interested in the tarot. By way of an answer, we're reprinting a riddling dialogue between Howard Gayton and our very own Rex Van Ryn on the nature of magic. Howard and Rex worked together on the graphic novel John Barleycorn Must Die, and this extract was originally published on their blog. H - Yes, I believe there is: in the sense that there is ‘existence,’ and existence is an objective fact. This is not something that one could ever completely define however. In the Kabbalah tradition, as I understand it, it is suggested that there's a realm of existence that we can never ‘know.’ At the start of the Taoist classic text, The Tao Te Ching, there's a wonderfully absurd discussion of the futility of even attempting to discuss that which the text is about to discuss in depth! After years of trying to find that ultimate reality, I have been forced to accept that it is just a mystery, and will forever remain so. R – Is there an objective reality? Absolutely not. Unless there is. Is dogma created by taking the mystery out of religion? R - Is the Pope Catholic? H - Yes, he clearly is. Now answer the question. R - All right then. Probably. H - Okay, I think that dogma is partly created by the removal of the mystery, but is also often quite deliberately created as a ‘political’ act in order to keep people under control. Is magic an internal process? If so, is it only an internal process? R - It is, but magic can be externalised if you bring someone into the process. For example there is the story told about an assassin who called a man at 6:00 on Monday evening, and told him that by 6:00 the following day he would have killed him. The man was duly terrified. The following day, the assassin called the man again at 6.00 to say that he had changed his mind and was going to kill him at 6:00 the following day. The man’s terror increased. This continued each day of the week, and by Friday the man died of a fear-induced heart attack. Of course the effectiveness of this method of assassination relies on the victim's state of mind. If the recipient of the phone call had simply said “f**k off,” the assassin wouldn’t have been paid! Are matter and consciousness intimately connected? 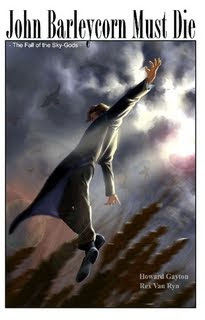 If you are creating and acting on a magical intention, can one ever fully know the consequences of that action? R - No, you can’t. H - This question arose when we were discussing magic and the conversation turned to the issue of ethics in a relativistic world. This is something which often exercises my mind. Can we ever know the consequences of any actions? There is a Taoist tale which goes something like this: Once there was a farmer, whose horses ran off during a storm. The villagers all commiserated with him, saying, “That’s terrible!” The farmer said, “Maybe.” The next day, the farmer’s son, who had been out searching for missing animals, came home with a herd of horses that were even more beautiful than the ones they'd lost. The villagers said to the farmer, ” “How lucky you are!” The farmer said, “Maybe.” The next day, while breaking in one of the horses, the farmer’s son fell off and smashed his leg...etc., etc.. While we can’t ever fully know the consequences of any actions, magical or otherwise, I do think that the intention under which one takes an action has an influence on its effect. R - Yes, I think that’s a fair point. I don’t think it’s necessarily true, but it’s a fair point. If one can’t be certain of consequences, how then does one decide to act in any given circumstance? R - One tries to do the right thing. H - If there are no absolutes to judge by, how do you know what is the right thing? R - You don’t. It’s a personal thing, what one considers personally is the right thing to do. R – See, you can’t think of an answer either can you? H - No. I concur with your previous statement, damn it! Does Aleister Crowley’s dictum, “Do as you will is the whole of law,” imply a lack of compassion? R - I always thought it did, until you gave me your view on it. Now I don’t know. H - I think it depends on whether the ‘w’ in will is capitalized or not. If it is, then he is referring to the Will as a force, which is a magical principal – which could mean that what he is actually saying is that the Will is the moving force of creation. We are all using our Will all the time, though most of us are doing so unconsciously. If the ‘w’ is in lower case, then I take that to mean “do as you want,” without the corollary statement: “but harm none” – in which case, it almost certainly does imply a lack of compassion. Does one need to go on a journey in order to discover there is no journey? R - Yes and no. H - Do you want to expand on that? R - Does this spring compete with last spring to be a better spring? R - That’s all I’m prepared to say. H - My answer to the original question, then, is...probably. And does this summer compete with last summer to be a better summer, Rex? R - You know full well it does, Howard. Is love the closest thing to truth? R - I'm not answering that. It's too poncy a question. H - Even though you were the one who stated that it was, in our discussion just yesterday? With a tear in your eye. R - That was yesterday. I’ve moved on. Do you have a memory palace? 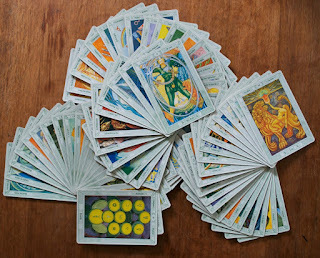 Have you ever used one to aid your study of the tarot? In the book that comes with the English Magic Tarot, Andy details exactly how you can use this ancient memory technique to deepen your knowledge and bring the cards vividly to life. One fine day, not too long ago, Rex was talking to Steve about memory palaces, when Steve said “I know, why don’t we make one. You know, a physical one that we could hold?”. So they did, and we thought we'd share it here. But…you’ll have to wait until you get hold of the box set to see how it all works. 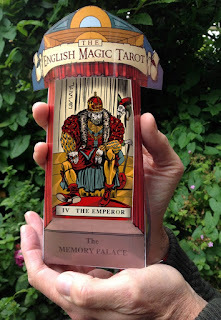 The English Magic Tarot is a brand new tarot deck set in the heyday of English Magic. Brought to you by renowned artist Rex Van Ryn, colorist Steve Dooley, and writer Andy Letcher, this deck has a dynamic, graphic style. The cards contain a depth and movement more associated with graphic novels than the tarot, and offer a captivating way to take charge of the stories we tell about our own lives. This week, Andy gives us a sneak preview of what's included in the English Magic Tarot boxed set.